China didn’t debut a stealth jet in January, it debuted a stealth jet prototype. There’s an important distinction. The development cycles for modern combat aircraft are measured in decades, and even if the Chinese are able to field a operation aircraft derived from the J-20 it likely won’t be before the late 2010s at the earliest. We have no idea how similar an eventual operational J-20 variant will be to the J-20 we’ve seen, which makes speculating about its capabilities difficult. Similarly, while the J-20 is much bigger than the F-22, this is more of a deliberate design choice that reflects the J-20’s likely intended mission rather than a straight advantage over the F-22. Bigger combat aircraft can hold more internal fuel and boast a longer range and heavier warload, but typically are less maneuverable. What we’ve seen of the J-20 seems to support this theory. Its large internal fuel volume and roomy internal weapons bays seem to indicate that an eventual operational J-20 would serve in the long-range interception role, possibly against US or allied surface ships, features that China’s coastal geography and the PLAAF’s lack of tankers necessitate in this mission. The rapid modernization of the PLAAF will certainly impede the US military’s ability to operate in the western Pacific. However, Barron’s hugely overestimates the threat posed by the J-20. The assertion that the J-20 is stealthier than the F-22 is completely unsupported, and very unlikely. The designers of the J-20 prototype we’ve observed seem to have focused most of their stealthing efforts on the aircraft’s front half, and the tail and round exhausts of the J-20 are likely highly detectable. The J-20 does appear very stealthy when viewed from the front, and this suggests that when faced with a choice between stealth and affordability the PLAAF has focused on minimizing the J-20’s detectability by fixed radars. This supports the idea that the J-20 is primarily a strike and interception aircraft, a mission completely distinct from the all-around stealthy F-22. The J-20 is a major step forward by the PLA, and an eventual operational variant will likely significantly enhance the capabilities of the PLAAF. 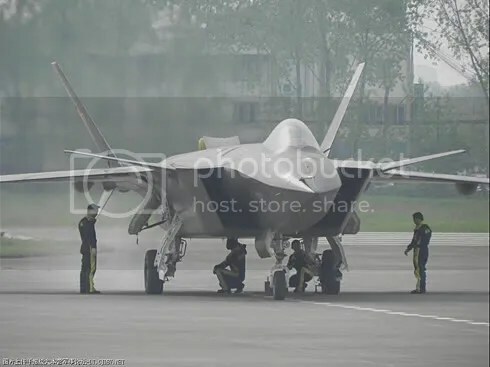 However, depicting it as an immediate threat is an overreaction, and China’s lack of experience operating world-class combat aircraft will likely decrease the operational effectiveness of any Chinese fifth generation fighter that actually emerges from this program, if any. China’s on its way to a more capable military. But any examination of just how difficult it is to run advanced aircraft development programs on time and on budget suggest that the Chinese will have a difficult time adopting the J-20 for operational service. Interesting to watch the J-20 saga unfold. Defense contractors and their congressional allies definitely want to hype up the threat since that means more $$ for R and D. They’re kind of missing the point though since any military confrontation with China over Taiwan won’t depend on stealth fighters, it’ll depend on our ability to intercept China’s missiles and project our air power from carrier groups. A few quasi-stealth fighters won’t have much impact there. More missile interceptors or longer-range drones to keep the carrier groups out of range would be ideal. This is all based, of course, on the assumption that the only reason China would try to invade Taiwan would be that it suspected it had sufficient technology to seize Taiwan before the US could intervene in any significant way. I suspect any invasion would be far more predicated on internal PRC politics than anything else. It’s not so much the J-20 that worries me – it would surprise me if it saw service in particuarly large numbers – its the next generation of aircraft which build on the experience the J-20 provides. Not just in building stealth aircraft – but also in countering stealth aircraft.